Carbuncle Cup: the end of localism? It’s been a busy few days for me. Since last Wednesday, when Woolwich Central was announced as the winner of Building Design’s Carbuncle Cup, I’ve been inundated with emails, tweets and requests for comment: I chaired the Greenwich Council Planning Board meeting in January 2007 at which the notorious building was approved. If you have missed the controversy I won’t repeat what I think of the building and why it got planning permission: you can read the piece I wrote back in June (when the development was first shortlisted for the Cup), a piece I wrote for the Guardian Comment is Free on September 3rd (Woolwich Central: my regrettable part in its rise) and for Building Design on September 4th (Just how did Woolwich Central get planning? (by the man who gave it) -subscription required). Media verdicts on the award have fallen into two categories. 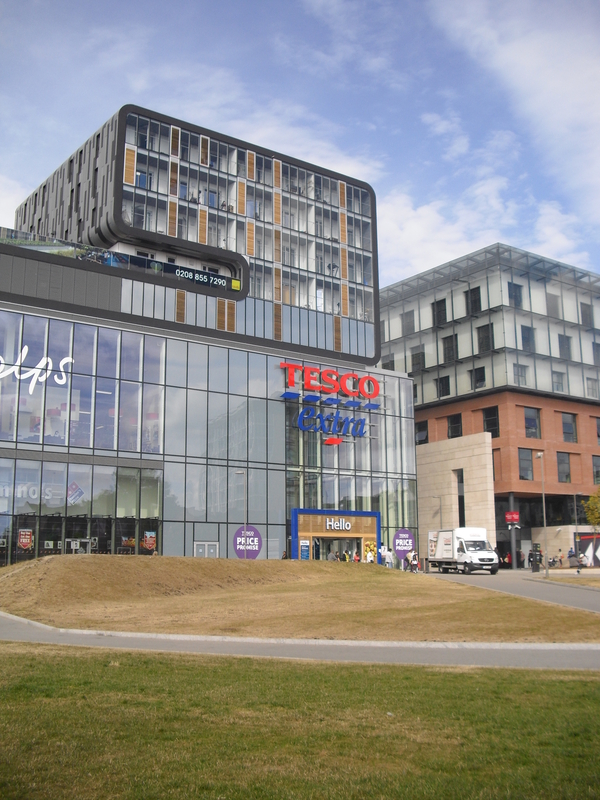 The first is that big, bad Tesco forced the council to give planning permission against its will. This is nonsense: Greenwich council gave planning permission quite willingly and needed no persuasion that a large supermarket was the answer to Woolwich’s problems. The second is an anti-localist judgement: if only the decision on the planning application had been taken out of the hand of incompetent idiots like me, higher powers would have intervened and turned the application down. Again, this is nonsense. It’s tempting to blame Greenwich Council, and the committee of councillors that I chaired, for this sorry state of affairs. But as I explained back in June, the granting of planning consent to Woolwich Central did not take place in a vacuum. Government policy strongly favoured (and still does) putting high-density residential developments, and large supermarkets, in town centres with good public transport links. Sheppard Robson are a good firm and the development was overseen by a high-calibre design panel chaired by Paul Finch (then chair of CABE and a former editor of all three of the UK’s top architectural magazines: Building Design, The Architects’ Journal and The Architectural Review) and including Tobias Goevert of Design for London, Paolo Testolini of BDP and Mark Fitch, a transport planner at Colin Buchanan and Partners: all people who know what they are talking about. Neither the Secretary of State nor the Mayor of London chose to call the application in. The only serious reservations that the design watchdog, CABE, expressed were about a 26-storey building at the northern end of the site, which has not been built. There was no shortage of experts, quangos and consultants from outside Woolwich in the planning process. To be fair to them – and me – what was built from 2010 onwards was rather different from what had been approved in 2007 thanks to a wave of cost-cutting changes in the interim. But what was missing was genuine local involvement in the planning process. No-one had asked the people of Woolwich, either by a formal opinion poll or by market research, whether they thought a large supermarket was what the town needed. When the decision was taken to approve Woolwich Central (then known as Love Lane) there were barely a dozen members of the public in the committee room to voice objections. Few of them objected to the size of the new Tesco in principle – instead the objections focussed on point of detail, such as the demolition of the Victorian post office and the Director General pub that the development entailed. Crucially most of these objectors, like us councillors, did not live in Woolwich anyway. Woolwich does not have the vocal, articulate amenity societies that wealthier parts of the borough like Blackheath, Greenwich and Plumstead Common have. Relying on traditional consultation methods (notices tied to lampposts, plans available for inspection in the library) had yielded few comments from people living in Woolwich itself. This was a decision made for Woolwich, not by its people: so dire was the need for Woolwich to regenerate that a huge 80,000 square foot supermarket was thought to be the only solution. So it’s very tempting to see the Carbuncle Cup as another nail in local government’s coffin: like Private Eye‘s Rotten Boroughs column, the Cup contains only bad news about local councils. Why should we entrust big planning decisions – which affect towns and cities for decades or centuries – to bumbling local politicians who are not up to the task? Has localism gone too far and is it time for more benign centralism, with less scope for local councils to screw things up? At its most extreme, this supposed crisis in local government has far more serious consequences than dubious planning decisions. The shocking revelations of systematic sexual exploitation in Rotherham – and the local Labour council’s failure to stop it – suggest that local government needs wholesale reform, not just tinkering. It’s heartbreaking to read in Alexis Jay OBE’s official report on the scandal how appalling acts of abuse (including young girls doused in petrol and threatened with being set alight) were disbelieved, brushed under the carpet and ignored. This systematic turning of a blind eye to child sexual exploitation (CSE) on a huge scale resulted from a failure of the local council to properly face up to, and scrutinise, the action and inaction of a wide range of agencies, including the council itself. Nearly 15 years on from the 2000 Local Government Act – which gave backbench councillors the responsibility to scrutinise council services and other public services such as policing and healthcare – councils are still struggling to adjust. As Paul Wheeler has argued, this was not just a failure of the local council: the local NHS, Police and Crown Prosecution Service must also shoulder blame – but it is the council’s job to hold these other agencies accountable. The buck stops at the Town Hall. This failure was not unique to Rotherham. In my 16 years as a councillor in Greenwich I lost count of the number of times that hard-working councillors were told to look away from problems rather than scrutinise them. It was worryingly common for councillors who asked innocent questions about what the council was doing – either publicly or privately – to be shouted at, receive abusive voicemail messages, or even be officially “warned” to shut up or face the consequences. The problems I encountered in my time as a councillor in Greenwich – bullying, a culture of secrecy, discouraging councillors and members of staff from raising concerns, particularly about the council’s finances and use of resources – were much less serious than what is alleged to have taken place in Rotherham of course. I never encountered any reports of CSE in Greenwich, or had any reason to suspect that they would not have been taken seriously if CSE had been alleged. But the problems faced by a council like Greenwich were (and are) on the same slippery slope as Rotherham (both councils have similar composition: more than four-fifths of their councillors are Labour). Although I should stress I was never leant on to vote to approve Woolwich Central, the subtle message was still clear: it’s already been decided that this is the best way to regenerate Woolwich and the plans could be amended but not turned down. This was not just a Labour Party problem: Conservative councillors were also part of the herd that approved the scheme. There are just as many Conservative (and even some Lib Dem) “Rotten Boroughs” as there are Labour ones. Local government’s problems can’t just be solved with structural changes (such as proportional representation in council elections, or the old chestnut of merging London’s 32 boroughs into five or six mega-boroughs), but only by the long hard, slog of cultural change: community councils where the community wants them, better-trained councillors who have to work hard, and account for it in annual reports to their voters, or else face recall, and new ways of engaging and consulting with rapidly-changing communities. Councils like Greenwich – where all contact between councillors and print or online media was actively discouraged until very recently – have a mountain to climb. If we want to stop decisions being taken in near-empty rooms, we need to bring people into those decisions, not lock them out or relocate the decision-making to Whitehall. Greenwich has started that process under a new Leader, and I wish the council well. But the answer to all these problems is not just “more localism”. In a Fabian pamphlet Letting Go, published in 2012, my friend Jon Wilson argued that Labour needs to “abandon the bossy administrator and management consultant, and become instead a movement about collective decision-making and common action, care not command.” Jon’s right to call for more devolution of power, and more accountable public services – for example by direct election of officials, and the transfer of public service to community-owned mutuals. But I can’t agree with his second key recommendation, that “Regulations and guidelines issued by Whitehall need to be massively cut.” After Rotherham, it’s difficult to argue that the Government shouldn’t have reserve powers to intervene when councils get things disastrously wrong. The current Government’s recent abolition of the Audit Commission – allowing councils to hire and fire their own auditors – is a recipe for disaster and I predict it’s only a matter of time before a financial scandal somewhere in local government prompts a rethink. For all its faults, it was Whitehall – not the local Town Hall – that finally blew the whistle on what was going on in Rotherham back in 2009, when the then Department of Children, Schools and Families put the council’s children’s services department into “intervention” – in effect a Whitehall takeover. It’s unclear how more “localism” in Rotherham would have resolved the problems there. And as the Co-op’s recent crisis shows, mutuals are not immune from mismanagement. Sometimes – just sometimes – Whitehall does know best and benign centralism needs to be invoked. Central intervention may not have prevented Woolwich Central getting planning permission – but if a central diktat had required that I and other councillors got more rigorous training in design, had consulted more innovatively, or subjected cost-cutting changes to the plans to closer scrutiny, then the outcome may not have been as bad. Localism is fine in principle, but in practice localism is only as good as the champions delivering it on the ground. This entry was posted in Uncategorized and tagged Architecture, Carbuncle Cup, Greenwich, Labour, Localism, Planning, Politics, Tesco, Woolwich, Woolwich Central. Bookmark the permalink. 7 Responses to Carbuncle Cup: the end of localism? I’ve been holding back from commenting on your blogs about the horrendous Tesco in Woolwich and your part in its being given planning permission. But I’m sorry to say your continuing “mea (kind of) culpa” doesn’t really impress me. About 12 years ago I applied for permission to build an extension to my house in Coleraine Road. At a planning meeting at The Forum (at which I recall you arrived some way into) where I nervously stated my case against the planning officer’s recommendation to refuse permission, you announced that you could not support my application to knock down a single-storey garage and replace it with a two-storey extension because “it would destroy the symmetry of those sets of houses” which, you told fellow committee members, you knew well. I remember your words so clearly because I was incredulous at them. A few moments later you and your colleagues turned my application down. I was incredulous because every pair of those semi-detached houses in Coleraine Road was already different: some had a garage attached; some did not; some were built over. Our attached neighbour’s garage was in the back garden (You can walk past again and check, if you like – it’s not changed). Many stressful months later a Planning Inspector overturned the decision after a simple site visit. We could finally create a decent home for our young children, who had lived in a horrible mess for far longer than we had expected. I have absolutely nothing personal against you, Alex. I respect citizens who – unlike the rest of us – give up precious time and take on the difficult responsibility to look after the area we live in. My own grandfather was a hard-working councillor many years ago. This isn’t meant to be any kind of personal attack. And I wouldn’t even have brought this up if it weren’t for your own repeated eagerness to admit your part in the Woolwich fiasco while pointing out that it wasn’t really you after all. But I can’t help thinking that if you were so wrong yet so adamant you were right about so simple a fact in your own neighbourhood then maybe you shouldn’t have ended up making decisions on such a grand scale as Tesco Woolwich. Thanks Matthew for your comment. Firstly, I am sorry if you felt your planning application was not handled fairly at a planning committee meeting I took part in. As my posts have sought to explain, politicians are mortal and few planning decisions will ever be universally popular. I have had some feedback from people who say they love Woolwich Central, and who think I should have no sympathy for those who have judged it to be a Carbuncle! It all goes to show that no-one ever served on a planning committee to become popular: I know of many decent councillors who always avoided Planning committees for that very reason. I don’t agree that a planning decision is automatically wrong if it is later overturned by a planning inspector. it’s the role of local planning authorities to make decisions for themselves rather than second guess what a Government inspector may think. I could write at some length about the many times that Planning Inspectors have, in my humble view, got it wrong! Thanks Alex. I respect your responding to my post, but – worryingly – you have missed the point entirely. It wasn’t the subjective aspects of the decision that I had an issue with at all. If you’d thought the application was an eyesore it was your role is to say so. It was your introducing into the debate a “fact” that simply was not true (demonstrably so, even now) which your colleagues took notice of and which had consequences for my family. Fortunately, we found a remedy when you dropped a clanger. Woolwich will not. Matthew, I’m sorry if I or anyone else ever made factual errors when speaking at a planning committee meeting, and if planning permission was wrongly refused then I am pleased this was rectified at appeal. Without knowing the details of the case – which I can’t recall off the top of my head – i really can’t comment further. I have to say Alex that “bullying, a culture of secrecy, discouraging councillors and members of staff from raising concerns, particularly about the council’s finances and use of resources” as well as it being “worryingly common for councillors who asked innocent questions about what the council was doing – either publicly or privately – to be shouted at, receive abusive voicemail messages, or even be officially “warned” to shut up or face the consequences. ” sounds absolutely appalling. Can I ask what you did about this during your 16 years? Thanks Steve. Problems with bullying in Greenwich Council have been well-documented in the media over several years – by the BBC, News Shopper, and the 853 blog, amongst others – as are the concerns I have raised about them (see http://www.newsshopper.co.uk/news/10293710.Blackheath_councillor_quits_over_Greenwich_Labour__bullying_and_sinister_threats_/). I don’t think I can be accused of not having raised concerns about bullying in Greenwich in my 16 years as a councillor there. Whenever I encountered inappropriate or bullying behaviour in Greenwich I raised concerns about it, both through internal Labour Party channels and through the council’s Standards processes. I encouraged others who had witnessed/experienced inappropriate behaviour to do the same. Sadly both processes were found faulty – in many cases complaints were ignored, not fully investigated, or complainants found themselves subject to “investigation”. Looking forward, it seems that the council, and the Labour Party in Greenwich, have learnt lessons and have moved on with a new group of councillors in Leadership positions. But in my view it’s still important to put a comprehensive anti-bullying policy, and new complaints procedures, in place to ensure these events never happen again.